Cape Town - Proteas seamer Rory Kleinveldt hopes his childhood dream of playing at the WACA in Perth comes true, as the series against Australia gears up for the Grand Finale starting on Friday. World No 2 bowler Vernon Philander is on track to be fit for the final Test and should retake his place in the playing XI. However, expected quick conditions will give the selectors an interesting selection conundrum which Kleinveldt hopes will go in his favour. Kleinveldt overcame a disappointing debut performance to take three vital wickets in Australia’s second innings in Adelaide, and looked every part the accomplished bowler he has been on the domestic circuit. The bowlers have also been working hard on the reoccurring no-ball problem, which has been a demoralising feature for the attack in the current series. 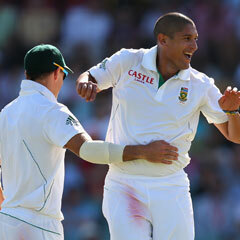 “I’m not too sure to be honest,” Kleinveldt said when asked about the cause. “In the warm-up game in Sydney I don’t think any of us bowled a no-ball. It has been a problem for both teams in the last two Test matches, but I can’t really put a finger on it. It is definitely something that we have to work harder on before the next Test match.